The American Legislative Exchange Council says it’s not a lobbying group. Then why have three states specifically exempted it from their rules for lobbyists? On April 20, Common Cause submitted a whistleblower complaint to the IRS, claiming that the American Legislative Exchange Council is “a corporate lobbying group masquerading as a charity.” The move was the latest salvo in progressive groups’ campaign to limit the influence of ALEC, a secretive nonprofit that brings together Republican state legislators and corporations to write and promote pro-business legislation. It could take several years for the IRS to decide whether ALEC is indeed a lobbying group required to register and disclose how much it spends on influencing legislation. But in three states—South Carolina, Indiana, and Colorado—ALEC has quietly, and by name, been specifically exempted from rules for lobbyists. The laws in those states allow ALEC to spend millions annually hosting corporate lobbyists and legislators at three yearly conferences, send “issue alerts” to legislators recommending votes on pending legislation, and draft boilerplate press releases for legislators to use when pushing ALEC model bills—all without registering as a lobbyist or reporting these expenditures. Legislators can receive scholarships from ALEC’s corporate donors to attend conference events, or they can legally go on the taxpayer dime. These exemptions are just now coming to light. In South Carolina, Democratic Rep. Boyd Brown recently discovered a 2003 state law that exempts ALEC from registering or disclosing its lobbying expenditures. One of the South Carolina bill’s sponsors was ALEC member Rep. James Harrison, a Republican from Richland County. The state’s lobbying law prohibits lobbyists from paying a legislator more than $400 a year for lodging, transportation, entertainment, or food. At its task force meetings, ALEC covers two nights in a hotel and reimburses lawmakers for travel expenses up to $350. It also draws on corporate money to fund scholarships for legislators’ conference registration expenses, which range from $150 to $500. 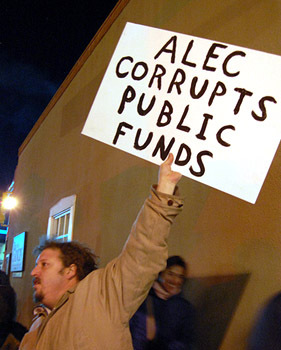 In Colorado, the late state Rep. Thomas Ratterree successfully introduced a bill in 1991 to amend ethics laws to exempt ALEC from lobbyist status. As a result, for legislators who attend ALEC events, “the expenses of such members for travel, board, and lodging related to such attendance [at ALEC events] may be paid from appropriations,” the law reads. The law also stipulates that if taxpayers are to foot the bill, then delegations to ALEC events “shall reflect equally the percentage of members from each party of the General Assembly.” All 18 of the state‘s ALEC members, however, are Republicans. Only a tiny fraction of ALEC’s 2,000 legislative members are not in the GOP, though the organization insists it is bipartisan. Unlike the South Carolina law, the Colorado and Indiana statutes exempt several groups, not just ALEC. In Colorado, three other groups, including the Council of State Governments and the National Conference of State Legislators, are exempt. In Indiana, five other groups are expressly “not considered lobbyists”: the National Black Caucus of State Legislators, Women in Government, the National Conference of Insurance Legislators, the Council of State Governments, and the National Conference of State Legislatures. But Julia Vaughn, director and lobbyist for Common Cause’s affiliate in Indiana, says any challenge to ALEC’s exemption would die quickly in the state’s heavily Republican legislature. As corporations continue to drop their membership, ALEC’s representatives claim it has been unfairly singled out by a left-wing “intimidation” campaign,” arguing that the organization provides an educational, nonpartisan resource for often understaffed state officials—much like another exempt organization, the National Conference of State Legislatures. The Denver-based National Conference of State Legislatures is a research and advocacy group that pools the resources of state legislators nationwide. Every state legislator is a member, making the group “as bipartisan as possible,” says Jon Kuhl, an analyst for NCSL. “Our president rotates every year between the parties.” NCSL also endorses laws, but they face a high bar for its seal of approval: Legislators from across the political spectrum must pass them by a two-thirds majority. When NCSL does promote a law, it is usually something that members across party lines can agree on, like battling unfunded federal mandates. Both organizations take corporate donations, but only in ALEC do corporations have voting rights. Alongside state legislators, representatives of corporate members propose and vote on the laws they want to see passed at the state level. Documents released this month by Common Cause show an overwhelming number of ALEC model bills get approved unanimously by task forces comprised of private- and public-sector members. ALEC’s model laws and membership lists are kept private; NCSL’s endorsed laws are available online. These distinctions have led Common Cause affiliates to demand that state attorneys general review and revoke ALEC’s nonprofit charity status. Pressure from Common Cause and Color of Change have prompted 14 of ALEC’s corporate members, including Coca-Cola, McDonald’s, and Procter & Gamble, to drop out of the group. Thirty-four legislators have also quit. ALEC has announced it would shelve the task force that approved controversial voter identification laws and “stand your ground” gun laws. ALEC meetings have been conducted mostly behind the scenes for decades, but its conference later this week in Charlotte, North Carolina, will likely draw more attention. Among the documents recently released (PDF) by Common Cause is a schedule and agenda for the get-together. ALEC member think tanks from Michigan and Arizona will sponsor a slew of controversial model bills aimed at public-sector unions. One would make it easier for public employees to call an election to decertify their union, and another would make it more difficult for unions to deduct dues from member paychecks. “ALEC spends a lot of time encouraging passage of laws, and everyone has a right to do that,” Common Cause’s Vaughn says, “but they should have to disclose how much they spend doing it, just like us and the Chamber [of Commerce] and the AFL-CIO.” Common Cause spent $190,000 last year as a registered federal lobbyist for campaign finance reform and President Obama’s jobs bill. Its Indiana affiliate spent almost $11,000 on lobbying in 2011, according to its public filing with the state.